One day, the idea of making marks on sheets of flattened tree guts to share ideas with others will be laughable. But for now, the experience of writing or drawing on a piece of paper still feels more natural than it does on a glass or plastic tablet. Moleskine’s new Adobe Creative Cloud connected Paper Tablet strives to be a bridge between the two, letting you sketch on paper and then immediately edit and manipulate a digital version of your work in Adobe Illustrator. It works remarkably well, as long as you’re not expecting the same experience that $1,000 hardware offers. The Moleskine Adobe Creative Cloud connected Paper Tablet tries to emulate the look of a digital tablet with stacked pages that have a rounded finish. It’s strictly an aesthetic feature, however. The Moleskine Pen+ Ellipse connects to a mobile device or your computer using Bluetooth, and connectivity status is indicated by a flashing, color-changing LEDs and audible beeps. You’ll need to reconnect the Moleskine Pen+ Ellipse every time you re-open Adobe Illustrator. The digitized character in Adobe Illustrator (left) versus the original drawing in the Moleskine Paper Tablet (right). Every last nuance of your sketch is captured, so more often than not you’ll want to clean up your strokes using Adobe Illustrator’s tools. If you only had to buy the $35 Adobe Creative Cloud connected Paper Tablet to add this functionality to your Adobe Illustrator workflow, I’d be inclined to recommend it. Previous collaborations between Moleskine and Adobe required users to snap a photo of a drawing in a notebook using a special app which would convert the image into editable strokes and vectors, but I’ve never found those conversions to be as accurate as I want them to be. This new solution works much better if your sketches are destined for Illustrator. 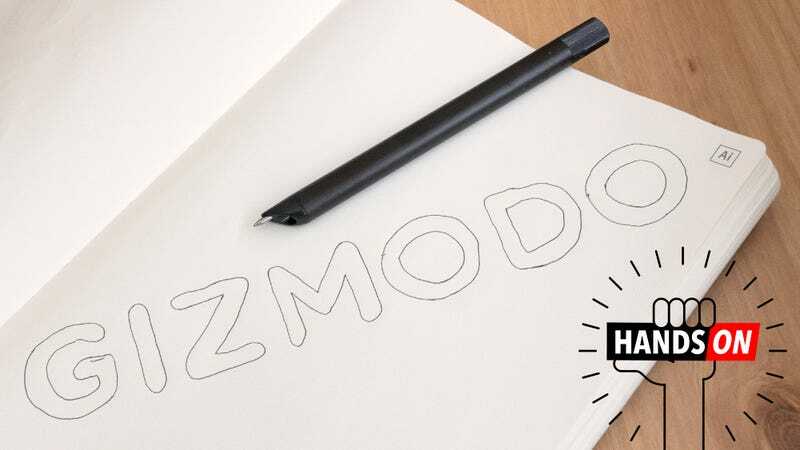 But in addition to the $35 notebook, you also need the $179 Moleskine Pen+ Ellipse to make it all work, and a copy of Adobe Illustrator at $21/month if you buy it for a year—so the cost starts to quickly add up. Unless inspiration only strikes you when you’re staring at a blank sheet of paper, you might be better off going with one of Wacom’s cheaper Intuos $80 drawing tablets instead if you’re looking for the most affordable solution.